This recipe right here is proof that sometimes the best things come when you make a mistake. 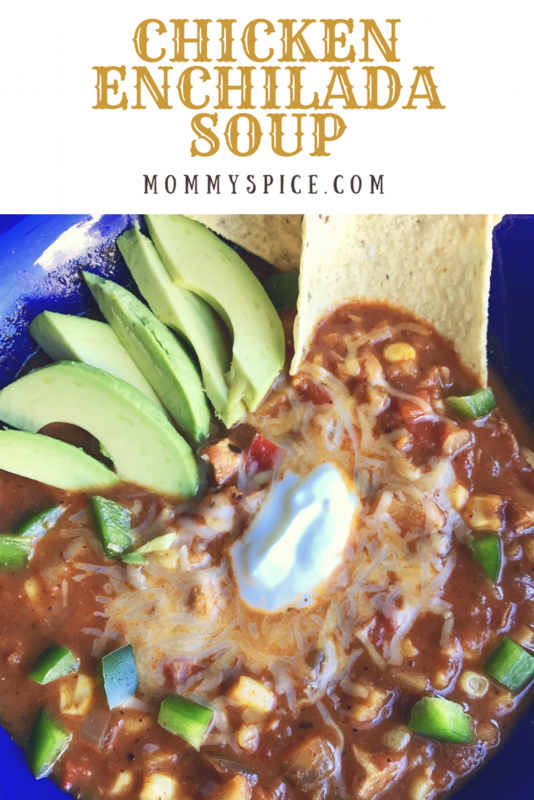 I have a tried and true slow cooker chicken enchilada soup that I have been making for YEARS. I went to throw it together the other night and had forgotten my can of enchilada sauce at the store. 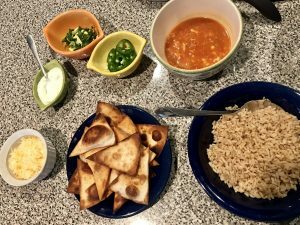 I’ve made home made enchilada sauce in the past, however I was short on time. I took the flavors I knew I needed and just started throwing everything in this soup pot. Literally everything, so many spices, don’t let the ingredients list scare you away! I also made it on the stove top instead of my trusty crock pot, told you I was short on time! 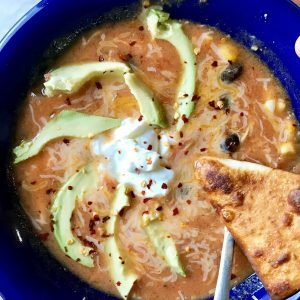 This turned out to be a really great variation of a classic dinner around our house and I couldn’t be more excited I forgot my enchilada sauce and let the day get away from me. Speaking of the day getting away from me, I strive to keep it real with you guys and had to share something that happened when I made this dinner the other night. 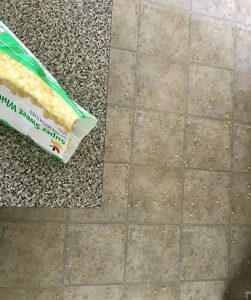 Brand new bag of frozen corn, spilled over on my counter and it flew EVERYWHERE! Two of my three children were home when this happened and just laughed and laughed at what a mess Mommy had made. Messes are all part of the process right?? That being said, we’re still finding random corn pieces 2 days later. In a large soup pot melt butter over medium heat, add to that your diced onion and pepper and let that sauté 5 minutes or until onions are translucent. Add garlic and stir until fragrant, 1 minute should do it. Now the fun can start, dump in all the rest of your ingredients and spices. Start with 2 cups of chicken stock, you can always add more later if your soup is too thick. Give everything a really good stir to combine, and bring to a boil. Reduce to a simmer and put a lid on your pot for 15-20 minutes. When time is up, check your soup to see if you need to add more stock to thin it out a bit. Serve hot with any desired topping you like! My favorite way to serve this soup is with a little toppings bar, start with a bowl of soup and go as wild as you like. Cream cheese may seem like an odd add on ingredient, however it can help to cool down the soup heat-wise if it’s too spicy, and adds a nice creaminess. Be sure to add the cream cheese to the soup when it’s very hot so that it will melt and all come together. I love to top mine with shredded cheese, avocado, fresh jalapeños and crunchy chips. I’ve got 2 tips for this one. 1, use leftover chicken! Rotisserie chicken would be great, also saves you a good bit of time which is perfect for a weeknight meal. 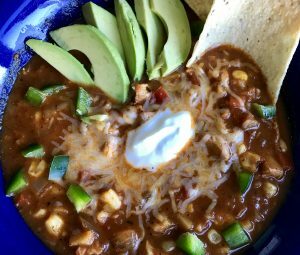 I suggest dicing or cubing your cooked chicken, most chicken enchilada or tortilla soups are cooked low and slow with the chicken being put in raw. This means the chicken is being cooked in liquid and will fall apart and shred beautifully. However, I really loved the bite I got from the cubed chicken as a change of pace. My second tip is, if you don’t feel like dumping the whole spice cabinet into your soup like I did, GET THE ENCHILADA SAUCE! Such a time saver and will do a lot of the seasoning for you. If you go the enchilada sauce route, leave out the 8oz can of tomato sauce and dry spices. 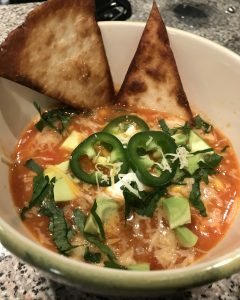 The addition of the cauliflower rice is a good way to keep this soup Keto, leave out the black beans and frozen corn and you’ll cut out even more carbs. Another easily integrated dinner for anyone in the family on a diet without having to make them a separate meal. You can really see the difference in the color of the soup, the one on the right was made in the slow cooker using enchilada sauce and the one on the left was made on the stove top with tomato sauce and spices. Also any addition of cream cheese or greek yogurt can make the soup appear lighter as well. No matter the shade of soup, the flavor will be delicious!